(Natural News) They say people are known by the company they keep, and if that’s true, then Bill and Hillary Clinton should find better people to associate with. In late November, the Justice Department announced it had indicted three senior executives at various U.S. defense contractors in connection with a plan to defraud the military in pursuit of an $8 billion troop supply contract. In addition, the Justice Department charged the three individuals with violating the Iran sanctions regime. Abul Huda Farouki, 75, of McLean, Virginia; his brother Mazen Farouki, 73, of Boyce, Virginia; and Salah Maarouf, 71, of Fairfax, Virginia, were each charged in an indictment filed in the District of Columbia with two counts of major fraud, one count of conspiracy to violate the restrictions on doing business with Iran, four counts of substantive violations of those restrictions, and one count of conspiracy to commit international money laundering. One of the suspects, Abul Huda Farouki, was the CEO of Anham FZCO, which secured the $8 billion contract in 2011 to supply the Pentagon with food and equipment for deployed U.S. troops; Hillary Clinton just happened to still have been serving as Barack Obama’s secretary of state at the time. The contract was obtained because the company lied about cost estimates. “The indictment alleges that the defendants schemed to defraud the Department of Defense in connection with the SPV-A contract by submitting bids that contained knowingly false estimates of the completion dates for the warehouses and by providing the government with misleading photographs intended to convey that Anham’s progress on the warehouses was further along than it actually was,” said DoJ’s statement. In addition, Farouki cut down on expenses by shipping U.S. military supplies through Iran instead of via legal, though more costly, routes, in violation of the Iran Sanctions Act. Also, according to the indictment, the defendants “and others” brought building equipment and other materials to a proposed warehouse complex site to make it seem as though there was active construction taking place when there was no construction underway. Conspirators photographed the site and then provided those pictures to the Defense Department, only to largely deconstruct “the staged construction site,” the press release notes. At one point The Wall Street Journal was preparing to publish a story exposing Anham’s practice of shipping vehicles and supplies through Iran, the DoJ said, citing the indictment. After becoming aware that the story was set to be published, Farouki emailed a senior DoD official to claim, falsely, that senior company executives were not aware that shipments were being sent through Iran, enroute to Afghanistan. Open Secrets — which documents campaign contributions among other related expenditures — noted that Farouki and his wife have given hundreds of thousands of dollars to Democrats over the years, including the Clintons and Obama. It should also be noted that Hillary Clinton’s habit of steering lucrative government contracts to major donors was well-documented in the book and movie “Clinton Cash,” Big League Politics noted. But it gets better — or worse, depending on your point of view. As The Gateway Pundit pointed out, longtime Clinton associate and former governor of Virginia Terry McAuliffe was on Anham’s board of directors. McAuliffe was also chairman of the Democratic National Committee and chair of Hillary’s failed 2008 presidential bid (which she lost to Obama). It’s not known whether the Clintons or McAuliffe were aware of the alleged defrauding by Anham, but what is clear is that, yet again, they are all associated with nefarious people who have been accused of shady dealings with the U.S. government. 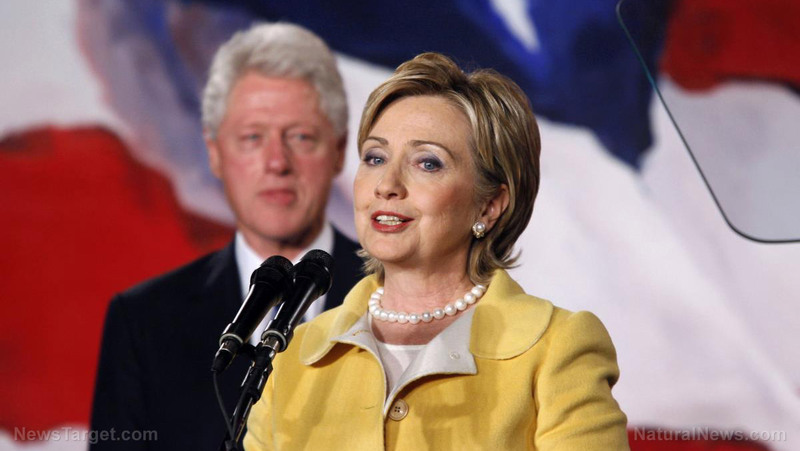 Read more about the various and sundry Clinton scandals at Clinton.news. Next : How many Leftists are willing to bleed and die in order to take guns away from Americans who cherish the Constitution?